DALLAS — Without having a first-round pick for the first time since 2009, the Dallas Cowboys are treading into a precarious situation. 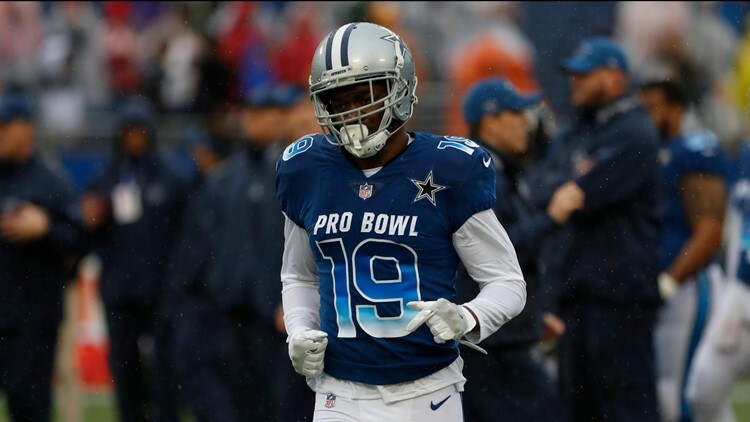 During their Week 8 bye last season, the Cowboys dealt their first-round pick to the Oakland Raiders for receiver Amari Cooper. Now, the Raiders are in possession of three first-round picks with the Cowboys' selection netting them the 27th overall selection. For the eighth time in the Jerry Jones ownership, the Cowboys are without a first-round pick, which no doubt causes consternation among many Dallas fans due to the bad memories conjured from at least the last four times the Cowboys were barred from the first round. However, things are a little bit different this time as compared to previous years. One of the phrases heard at the Senior Bowl from chief operating officer Stephen Jones and later at the NFL combine from coach Jason Garrett was that the team did have their first-round pick from 2019. It's just that their pick came early in the form of Cooper, and he did perform at a Pro Bowl level and turned the Cowboys' season around. Looking at the Cooper trade from a projection standpoint and not just what he contributed in-season, the former No. 4 overall pick from the 2015 NFL draft will be 25 years old when he enters his fifth NFL season. From a years served vantage, there is no question he is a seasoned veteran. From an age point of view, he is comparable to the situation Dallas had on their hands with 2003 first-round pick, cornerback Terence Newman. The Kansas State product was 25 years old when he suited up as a rookie for the Cowboys. So, Cooper has the right blend of experience with gas left in the tank. That is an important aspect to remember because the Joey Galloway trade in 2000 and the Roy Williams trade in 2008 gave Dallas receivers who could help the team in the moment, but probably weren't going to be offensive fixtures the way Cooper will. Ultimately, Dallas replaced those receivers with premium picks with Antonio Bryant in 2002 in the second round and Dez Bryant in 2010 in the first round. But the carnage those trades left upon their subsequent drafts is the true area that the Cowboys have yet to prove they've bettered themselves. Yes, they made a trade for an impact player who actually produced. However, is that trade still going to be detrimental to their draft? In 2000 and 2001, the Cowboys didn't have a first-round pick, and their drafts just read like a flow chart of reach after reach. The longest anyone stayed in the league from those two drafts was interior offensive lineman Matt Lehr, who played eight seasons. Most were out of the NFL by 2004. Speaking of 2004, that was another consequential time in recent history where Dallas didn't have a first-round pick. They dealt away their first to Buffalo and stockpiled two firsts in the 2005 draft. So, their first pick wasn't until the second-round when they selected running back Julius Jones from Notre Dame. They were able to find solid contributors in receiver Patrick Crayton, cornerbacks Jacques Reeves and Nate Jones, and guard Stephen Peterman worked out well for the Detroit Lions. However, their draft was somewhat anemic. Out of all of them, the 2009 draft not only takes the cake, but chucks it off the High Five and onto the windshield of an 18-wheeler that wrecks and causes a 30-car pileup with traffic backed up as far north as the Sam Rayburn Tollway and as far south as the Woodall Rodgers. The Cowboys traded a first, fourth, and swapped seventh-rounders with Detroit for Williams. Yes, Dallas had a total of 12 picks in the draft, but they didn't start picking until round 3, and they blew it with linebacker Jason Williams and tackle Robert Brewster, who was out of the league by 2010. Sixth-round tight end John Phillips was last seen with the Arizona Cardinals in 2018, but seven of the 12 were out of the NFL by 2011. Not being able to stay with a club is one thing (i.e. receiver Jimmy Smith in 1992); not being able to keep a job in pro football is quite another indictment of how poorly an organization evaluated you before the draft. Those are the kinds of disasters the Cowboys need to avoid. Dallas will have its fewest selections since 2010 with six. The Cowboys were able to find two Pro Bowlers and a solid contributor in that draft with Bryant, linebacker Sean Lee, and defensive tackle Sean Lissemore. What they will need to do is avoid reaching just because they feel like they need to make up for not having a first-round pick. If they believe their mantra about Cooper being that first-round pick, then that should help them stick to their best player available philosophy. Do you think that the Cowboys can come away with a strong draft class despite having to go nearly 60 picks without a selection? Share your thoughts on the upcoming NFL Draft with Mark on Twitter @therealmarklane.